to demonstrate his 20th documented hypocrisy. On his Fox News show yesterday, Glenn Beck questioned Louis Farrakhan's demonizing of Americans. The following, then, is a press release from the liberal media watchdogs, Media Matters for America. As you read this example of Beck's hypocrisy, the 20th in 10 months of close scrutiny from this Review, ask yourself how someone who claims to have values and principles can turn around and violate his own principles, values and standards on a fairly regular basis. 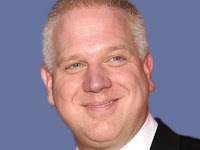 If anyone has an answer -- besides the stated conclusion of this reviewer, i.e., that he is nothing more that a fraud with no real principles, -- by all means leave a comment with your take on this phenomenon, the self-proclaimed "rodeo clown," Glenn Beck. More Hypocrisy: Glenn Beck Takes Issue With Calling Opponents "Demons"
Prompted by Louis Farrakhan's remark that America is a "habitation of devils," Glenn Beck asked, "[W]hat happens when you can convince enough people" that something is "full of demons"? Beck himself has a long history of linking progressives to "the devil" and calling them "enemies of God." Beck Suggests It Is "Dangerous" To "Call Americans 'Demons' "
BECK: And then we have the truly spooky stuff that happened over the weekend. There is new video evidence produced by the Iranian regime that says the current unrest in the Middle East is a sign that the Mahdi, or the Islamic messiah, is about to appear. They're calling this video The Coming is Near. By the way, this program maintains that he is the opposite -- exact opposite of good and bad in the Book of Revelation. But that's not the way Louis Farrakhan sees things, because, over the weekend, Louis Farrakhan was also quoting -- you know, he's a Muslim -- quoting the Book of Revelation. Farrakhan is saying that America now is the Great Satan, or saying that it is now full of demons -- you and me. Watch. FARRAKHAN [video clip]: America's not filled with human beings. America's filled with beasts. She has become, as John the Revelator said, the habitation of devils. BECK: OK. So what happens when you can convince enough people -- or at least one people; oh, what do you say, 18 people -- that America is full of nothing but beasts? Remember, anybody who mentions Jesus is dangerous. But listen to Farrakhan. Calling Americans "demons" -- I don't know how many were here, but a couple of weeks ago, it was in front of 18,000 people. Beck Has A History Of Linking Progressives To "The Devil"
BECK: If you believe in the, you know, the war in heaven, where the -- you know, a third of the angels were cast out and all of that stuff, it was about man's choice. BECK: And he would provide a savior. And Satan's plan was, "Hey, I'll save everybody. Give me the credit. Give me the credit, I'll save everybody. I'll make sure that everybody returns home. It's going to be fantastic. I'll -- you just take away their choice and give me the credit." Well, gee, I think that plan was rejected, and that's because God knew that failure was important for growth. He knew that we would fail and he would provide the failure so when we hit the bottom, we would have a chance -- we would know there was hope for the only thing that really matters, and that is redemption. Eternal redemption. BECK: That's right, Mr. President, we're dummies. We don't have a single new idea. Yeah, you know what? Republicans don't have a lot of new ideas. They're a lot of retread ideas. That's why I think, Mr. President, you should talk to those Tea Party people. 'Cause they've got some really new ideas they haven't tried in about, oh, 150 years. 'Course, now, your ideas -- your ideas, they're brand new. Boy, when I first heard your ideas about-- 1848? Trying to think, when did Karl Marx write that stuff down? Oh, no, seriously. You've got ideas that have unquestionably failed, and failed spectacularly, every time they've been tried. No, I know, I know, "Oh, they've just never been done right." Beck then displayed the following image on the screen behind him. For the video clip, click here. BECK: We were just talking in the break. We found some old audio that came out during the election that Pat played for me -- he's in charge of our audio vault. And I know I've heard it, but I didn't recognize the content -- or the context, really until now. Things are starting to fall into place, and when he played it, I hadn't heard it in its entirety in quite some time. And we were talking about collective salvation -- it is evil. Collective salvation -- excuse me for being a Jesus freak -- is from Satan. Collective salvation is from the devil, not God. BECK: I was telling you about Van Jones, and I said, "Do we run with this? Do we run with this? Because we don't know for sure, but all evidence -- and I don't know if we can verify this, this, this, but look at the connection here." Most of it we did verify. Some of it we couldn't and we never put on. But I believe them to be true, but I don't say them because I couldn't nail them down. What stopped me from saying, "I can't prove these things, but"? I said to Pat -- I said, "Something's wrong. What do we do?" We both prayed. And we went home, and both of us prayed again, and then we both opened up our scriptures, unbeknownst to each other until the next morning. And I couldn't wait to see Pat, because I had an answer. I said, "You won't believe what I found." And he said, "Wait, wait, wait. Me first. About our conversation yesterday. I looked in Malachai." Look it up. Malachai 3:11. I'm paraphrasing -- I shall rebuke the devourer for your sake. To me, this message was clear: "He's not an enemy of yours. How dare you think he's an enemy of yours? Freedom comes from me, God. Freedom, your rights, belong to me, not you. I will rebuke anyone who tries to devour them." Beck: Progressives Are "Enemies Of God"
BECK: We learn from our mistakes. We can't change our history into something that it wasn't, but it's happening. We've got to grab onto the truth and cling to it, but what is the truth? Well, the truth about the civil rights movement isn't the Black Panthers and the threats causing Congress to pass the civil rights, that's bull crap! God did it, by working through people and inspiring people like Martin Luther King, and C.L. Jackson. And yes, white people like Bobby Kennedy and dare I say it, oh, my Gosh, I'm going to set the world on fire with this -- Roger Ailes. I think he spent some time in the civil rights movement. He was with Martin Luther King a couple of times, people from both sides of the aisle, people of all kinds, all races, different levels of participation. God led the cause because he is against oppression. But he does not conspire to work through hate groups. Stand up, stand together, stand with the truth. Stand with God. That is the one thing that they cannot fight. That is your only weapon is God. And he wields it, not you. You just stand behind him and just let him be your shield. It's the one thing that they don't have on their side. Now that's a pretty wild comment to make unless you go back to Saul Alinsky. Do you know what the dedication says? Do you know what the front page says of this book? Put it up here, "Lest we forget at least one over-the-shoulder acknowledgement to the very first radical from all of our legends, mythology and history and who is to know where mythology leaves off and history begins, or which is which, the first radical known to man who rebelled against the establishment and did it so effectively that he at least won his own kingdom." You put this together with collective salvation. May I quote the pope? Put the pope, Pope Benedict, here is what he said about collective salvation: "Wherever politics tries to be redemptive, it is promising too much. Where it wishes to do the work of God, it becomes not divine but demonic." CALLER: Hello, Glenn. I just want to thank you for your letting all of us know and bringing light to the fact that, you know, these people with this particular ideology are not our enemies. They are our heavenly father's. CALLER: Well, I'm a man of your faith. And, you know, I've been thinking that, and, you know, I've talked to people. But when you said it, it was just like a relief to me that this -- you know, I need to do what I need to do, you know?